Perfect super soft and chewy chocolate chip cookies that stay soft! Enjoy warm for a super ooey gooey center! 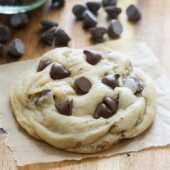 A must make for all chocolate chip cookie fans! In a large bowl or stand mixer, cream together butter and sugars until light and fluffy. Mix in egg and vanilla, followed by salt, baking soda and baking powder. Scrape bowl as needed. Mix in flour until fully incorporated and no streaks remain. Stir in chocolate chips by hand. Chill cookie dough for at least 2 hours or until it is thoroughly chilled. Preheat oven to 350°F. Line a rimmed baking sheet with a silicone baking mat. Scoop dough using a large cookie scoop (roughly 3 tablespoons worth of dough), spacing 2-3 inches apart on prepared baking sheet. If desired, top off dough balls with additional chocolate chips. Bake for 12-13 minutes. Cool on pan for 3-5 minutes, then transfer to a wire rack to cool completely. Store in an airtight container for up to several days or freeze for later. Recipe yields roughly 1 dozen cookies.